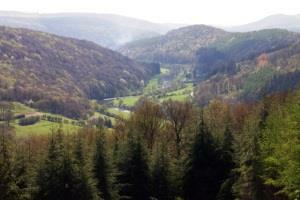 The woodlands of the lower Wye Valley are some of the most beautiful in Britain. Every season offers something special: bluebells in spring, lush summer leaves, fantastic autumn colour, and the beauty of winter tree silhouettes. Discover stately oak and beech trees as well as ash, cherry and small-leaved lime. Several viewpoints offer spectacular views across the Wye gorge and river, across to the Bristol Channel and the old Severn Bridge. You can enjoy these great views year-round but especially in winter, when the leaves have fallen. The Wye Valley combines a unique blend of Welsh and English influences. A place of breathtaking natural scenery and the birthplace of British tourism, the Wye Tour has enthralled discerning visitors since the 18th Century (including the landscape painter William Turner). It is difficult to imagine today that the lower Wye Valley was once teeming with industry. The Wye Valley Area of Outstanding Natural Beauty (AONB) is an internationally important protected landscape. It surrounds a 45-mile stretch of the meandering Wye Valley south of Hereford. It straddles the borders between England and Wales, Gloucestershire, Herefordshire and Monmouthshire. Recognised for its spectacular scenery, this living and working landscape is steeped in history and rich in wildlife, archaeological gems and impressive geological features.